It is commonly seen that users who have lost or damaged their Brother DCP-T700W software CD are forced to use generic drivers. However, we would recommend them to use Brother DCP-T700W driver package. Therefore, on this page we are sharing Brother DCP-T700W driver download links of Windows XP, Vista, 2000, 7, 8, 8.1, 10, Server 2003, Server 2008, Server 2012, Server 2016 for 32-bit and 64-bit versions, Linux and Mac OS X operating systems. 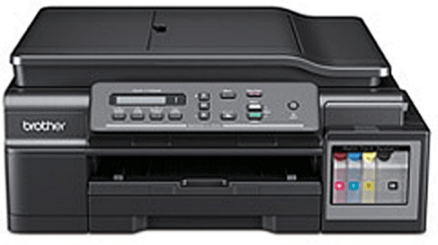 Additionally, to help you avoid driver installation mistakes we will also describe the right printer driver installation process on this page. Determine the version of OS where you want to install your Brother printer. Next, download the Brother DCP-T700W printer driver associated with your OS from the list of OS given below. Don’t hesitate to contact us for assistance if you have any problem in downloading the printer driver. To prevent driver incompatibility issues we are sharing only official Brother DCP-T700W driver download links on this page. This way you will be able to download genuine Brother printer drivers directly from its official website. To resolve all the doubts regarding printer driver installation procedure we are providing an installation guide. Our guide describes the printer driver installation process in a simple way so that you can install your driver without making any mistake. Please read our installation instructions carefully before installing your driver. For the efficient functioning of your printer, proper removal of the old driver from your computer is as important as the installation of the new driver. Therefore, you must remove your old driver files by using right uninstall procedure rather than deleting them manually. This DCP T700w all-in-one printer uses Black, Cyan, Magenta and Yellow colored inks for printing. These inks are available in bottles. The Magenta (BT5000M), Yellow (BT5000Y) and Cyan (BT5000C) ink bottles have print capacity of nearly 5000 pages per bottle. While the Black (BT6000BK) ink bottle can print nearly 6000 pages.